"I know and have read of your remarkable work in America," Sun Yat-sen wrote in a 1924 letter to Henry Ford. "And I think that you can do similar work in China on a much vaster and more significant scale." In retrospect, Sun, the father of modern China, and Ford, the father of modern assembly-line mass production, probably should have talked. But it was not to be. The closest Ford's eponymous motor company got to conquering the Middle Kingdom during his lifetime was to open a sales office in Shanghai in 1928. It sold a small range of imported Ford vehicles, including tractors built in Cork, Ireland, and closed down at the outbreak of the second world war. In 1978, with the mainland on the verge of reopening to the world, Deng Xiaoping welcomed Ford's grandson, Henry Ford II, on a visit to Beijing. The car maker began exporting trucks to the mainland the following year - but that too was destined to remain a niche business. Indeed, the road to success in the mainland market has proven to be a long one for Ford. The world's sixth-biggest carmaker has yet to achieve the vast scale - in what is now the world's biggest car market - that Sun spoke of nearly a century ago. That may be about to change. Ford today is embarking on its biggest concerted push in the mainland market yet, spending US$1.6 billion on four new plants that will start coming online from next year. 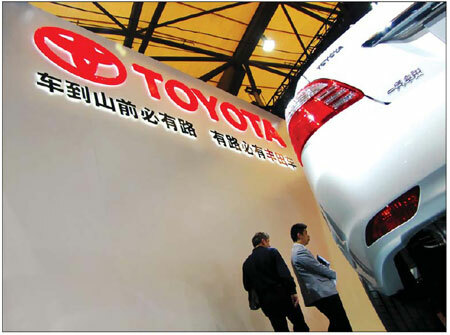 By 2015, it expects to triple its portfolio of car models for sale on the mainland, as well as double its dealership network and employee base. The aggressive plans are a key part of Ford chief executive Alan Mulally's target of drawing 32 per cent of total revenue from Asia-Pacific and Africa by 2020, up from 15 per cent today. A "big percentage" of that growth would come from the mainland, he said. "We are laser-focused on building the Ford brand in China," Mulally said in an e-mail. "The Chinese market certainly is a significant opportunity, and we are ready!" For much of the past decade, Ford was not ready for the mainland. In the 10 years starting from 2001, when it established its first mainland passenger-car joint venture, Ford globally racked up an aggregate net loss of US$21.3 billion. The losses came alongside a growing mountain of debt as Ford struggled with corporate indigestion following a number of ill-suited acquisitions. The financial crisis of 2008 and 2009 saw the other two members of the Detroit Three - General Motors and Chrysler - fall into bankruptcy followed by government bailouts, a fate Ford narrowly avoided. In the end, Ford kept its Lincoln brand, but closed down the 71-year-old Mercury marque. It sold off Aston-Martin, Volvo (to China's Zhejiang Geely) and Jaguar-Land Rover (to India's Tata Motors), and slashed its stake in Japan's Mazda to 3 per cent from 33.4 per cent. Ford closed dozens of plants and laid off tens of thousands of workers, which along with the divestments slashed its global workforce to 164,000 employees at the end of last year. This is down by more than half from the 358,675 on its workforce at the end of 2001. "There was a 10-year period where we had started this China joint venture but where we could never give it - and the Chinese market - our full attention, because we had some other major issues going on in the business," said Joe Hinrichs, the president of Ford Asia-Pacific and Africa. After years of painful restructuring, Ford today is back on track and in the black. 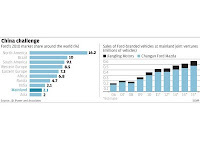 It globally sold 1.4 million cars in the first three months of the year, up 12 per cent from a year earlier. Revenue rose 18 per cent in the quarter to US$33.1 billion, while profit increased 22 per cent to US$2.55 billion. With the company in its best financial shape in over a decade, executives have finally been able to take a good look at the firm's business on the mainland. They have not really liked what they have seen. In the first five months of the year, Ford ranked as the 12th best-selling passenger-car brand on the mainland, with a modest market share of 2.6 per cent - just behind that of homegrown Great Wall Motors and slightly ahead of Japan's Suzuki. Ford's share of the booming mainland market is lower than in any of the other major regions where the company competes. "We knew all along our business over here didn't represent the status of our business in the rest of the world," said Hinrichs, who is based in Shanghai. To change that, Ford has shifted its expansion plans into overdrive. In Chongqing's Liangjiang New Area development zone, a small army of dump trucks and earth movers is rumbling around the site of a second, US$500 million engine plant that Ford broke ground on last month. Next door, at a cost of US$350 million, will be Ford's first mainland transmission plant. A few kilometres down the road, workers are fitting out the interior of Ford's second passenger-car assembly plant in Chongqing, opening next year at a cost of US$490 million. In Jiangxi province's Nanchang, Ford's 30 per cent owned commercial vehicle partner, Jiangling Motors, last July broke ground on a new US$300 million assembly plant. The combined expansions will lift Ford's output capacity in China to 1.1 million units, compared with the 582,000 vehicles it sold last year. "I don't think we've ever built anywhere the way we are building here," said Nigel Harris, general manager of sales at the Chongqing joint venture, Changan Ford Mazda. Analysts say the unprecedented building boom is a must if Ford hopes to gain ground on better-positioned rival brands like Volkswagen, GM, Hyundai, Nissan, Toyota and Honda, all of which have a bigger share of the mainland market. "This is a recognition that China has become the centre stage in the battle for dominance in the 21st century auto industry," said Bill Russo, the former head of Chrysler in China who now runs Beijing-based consultancy Synergistics. "They are playing catch-up, and they are making the necessary investment needed to get back in the game." Analysts say Ford's biggest challenges on the mainland have been the comparatively small size of both its product portfolio and its joint venture partner. The company is in the process of restructuring its three-way joint venture, Changan Ford Mazda, in which it now has a 35 per cent stake. After selling down most of its stake in Mazda, Ford has applied to form a 50-50 venture with Chongqing Changan. For its part, Chongqing Changan Automobile has historically been a smaller player in the mainland's car industry, when compared with larger municipally-owned groups like Shanghai Auto (partner of GM and VW), Beijing Auto (partner to Hyundai) or Guangzhou Auto (partner of Honda, Toyota and Fiat). "Changan is a second-tier partner without the political and financial clout of a Shanghai, Beijing or Guangzhou, and it is also a minus that incomes in Sichuan are still several notches lower than along the coast," said industry consultant Michael Dunne, president of Hong Kong-based Dunne and Company and author of the book American Wheels, Chinese Roads: The Story of General Motors in China. An introduction on Changan's corporate website traces the firm's history back to 1862, with the founding of the Shanghai Foreign Artillery Bureau. Today, Shenzhen-listed Chongqing Changan's parent company is China South Industries Group, a conglomerate directly under the State Council better known by its Chinese name, which translates as China Weaponry Equipment Group. China Weaponry was established in 1999, a year after Beijing ordered the People's Liberation Army to divest its business interests. It was spun out of the PLA's fifth machine industry department, established in 1963. Cars were not the parent group's first line of business. Changan entered the car industry in 1984 when it started producing micro-vans. In 1993, it entered its first joint venture, with Japan's Suzuki. The partnership with Ford was signed eight years later and the first Changan Ford - the cheap and cheerful Fiesta - came off the production line in 2003. Several models have followed since, but not enough. Walk into any Ford dealership in China today and you will, at most, be able to choose from just five car models: three made in Chongqing, one made in Nanjing and one import, a pricey SUV. The best-seller is the Focus, a smartly-designed compact that comes as a five-door hatchback or four-door sedan and retails from 104,800 yuan (HK$125,760). Sales of the made-in-Chongqing Focus have been Ford's mainstay in China, rising 23 per cent in the first five months to 84,920 units and accounting for 61 per cent of the company's mainland passenger car sales by volume. In addition to the passenger cars, Ford's commercial vehicle partner Jiangling also makes the Ford Transit, a popular shuttle bus. "Ford has not had the horses - products, money, leadership - to run a good race in China. That should change beginning in 2012, when the new products begin to arrive," Dunne said. Of the 15 new passenger-car models that Ford plans to introduce over the next four years, two have been announced and are expected to start local production next year: the next generation Focus and the Kuga, a small crossover-type SUV - one of the hottest-selling segments on the mainland. For Ford, it is all part of a change that has been a long time coming on the mainland. "We don't like our market position here at the moment," says Chongqing-based Harris. "It's not comfortable. It's not Ford." vehicles in China after selling only 38,500 in May. "Nissan buys up to 90 percent of the parts locally that are used at its China plants," said Bill Russo, a Beijing-based senior adviser at consulting company Booz & Co.
"As a result, it was not as exposed as some of its Japanese competitors to supply chain disruptions resulting from the Japan earthquake." In addition to Nissan's quick restoration of its parts pipeline and full production, robust demand from middle class buyers, strong brand positioning and fast access to high-growth second- and third-cities are all providing the carmaker a solid foundation to expand in China, Russo from Booz & Co said.